If you pay bills, you need Chronicle. It gives you the peace of mind of never having to worry about whether you paid a bill again. 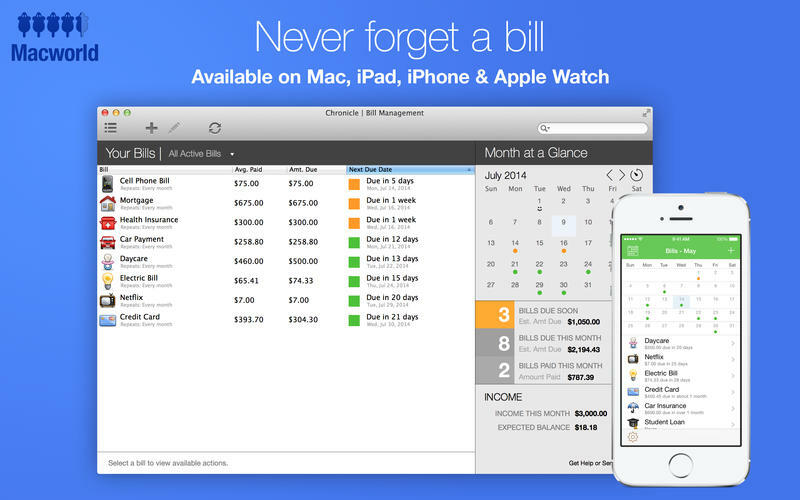 • Never forget a bill — get reminded when your bills are due with alerts that can be synced to your iPhone and across all your Macs, even when Chronicle isn’t running. • Easily pay your bills online using Chronicle’s integrated browser, or your default browser. 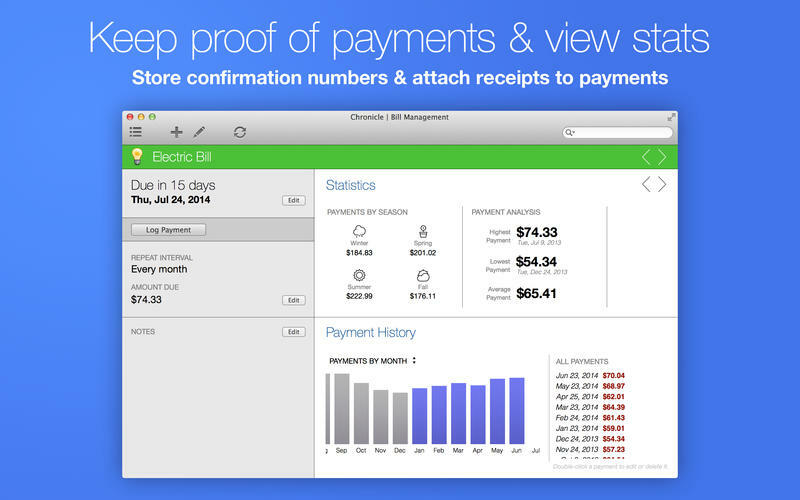 • Keep proof of all your payments — store confirmation numbers and receipts right in Chronicle, so you always have proof of your payments. You can sync Chronicle data with multiple Macs using Dropbox, details below! "Chronicle is an excellent App that has enabled me, once and for all to control my Bills and no longer have any surprises." "A great simple app to keep track of your monthly bills." Another free update with new features! If you like Chronicle, please consider taking a moment to leave an review or rating in the App Store, it really helps. 1. Support for bills with variable amounts due. When you check this box, an empty amount due will now show as "Not Set" instead of $0. And, when you log a partial payment, the amount due will automatically decrease. 2. Support for handoff between Mac, iPhone, iPad and Apple Watch. When you are viewing any bill (or all bills or a specific tag), then handoff will allow you to view the same bills on another device with one tap or click. 3. New, improved icon to better match iOS version and improve legibility on dock.